Carrot Soup 1915 – Create, Make & Bake! 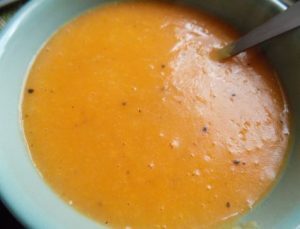 This recipe for carrot soup was published in Dr. Allinson’s Cookery Book (1915). Cook the vegetables in the water till quite tender then rub them through a sieve, add a little more water if necessary. Return to saucepan, add seasoning and butter, boil up and serve. NOTE: These days there is no need to use the sieve for the vegetables, unless of course you want to. A quick 5 second ‘whizz’ with a hand blender or in the food processor does the same job.